In August I visited the famous Frederik Meijer Gardens & Sculpture Park and finally understood why everyone loves it so much. 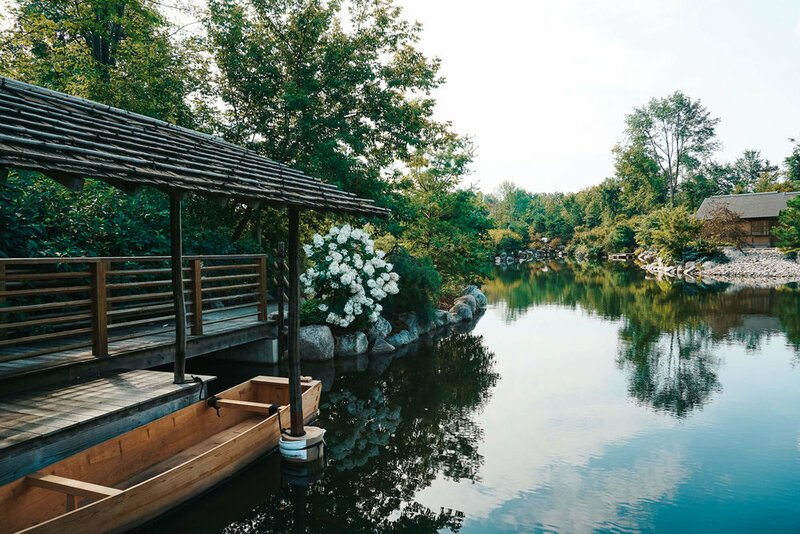 The 158-acre grounds offer eye candy for art and sculpture lovers, the masterworks are world renowned, and their gardens easily rank top in the country. The park is huge and it’s recommended to allot at least three hours during your visit. I can attest that my two hours weren’t nearly enough but that was all I could plan for. Upon arrival we were given a large map and I quickly pinpointed the places I didn’t want to miss. I knew prioritizing it this way would help me use my time wisely. The main building housed an indoor garden and tropical conservatory, which I enjoyed walking through. I felt like I was back in the Costa Rican jungle, a place that I hold dear to my heart. The conservatory is five stories, and hosts the annual butterfly exhibition in the spring. Beyond the facility I came across the amphitheater. Used for concerts and special events, the lawned rows added to its garden surroundings. Next on my checklist was the Japanese Gardens, an eight-acre sanctuary weaving contemporary sculpture with traditional Japanese garden elements, designed by Hoichi Kurisu. Kurisu is a Japanese landscape designer born in Hiroshima and trained in Tokyo. Funny enough, he also oversaw the construction of Portland, Oregon's Japanese garden (which was one of my favorites in the country until I visited this one) ...I'm apparently a huge fan of his work and didn't know it! We inched closer and the horse grew. Massive, in fact, the sculpture towered over us when we finally came face to face with it. There were some works of art in the sculpture park than were intriguing and inspiring. Others, like many artworks around the world, were a little scary! The sculpture park is comprised of outdoor sections, including a section called The Hollow, and another, The Gallery. The Gallery felt more garden-like, with delicately placed works throughout it. The Hollow on the other hand, had a sense of bizarre mystery. 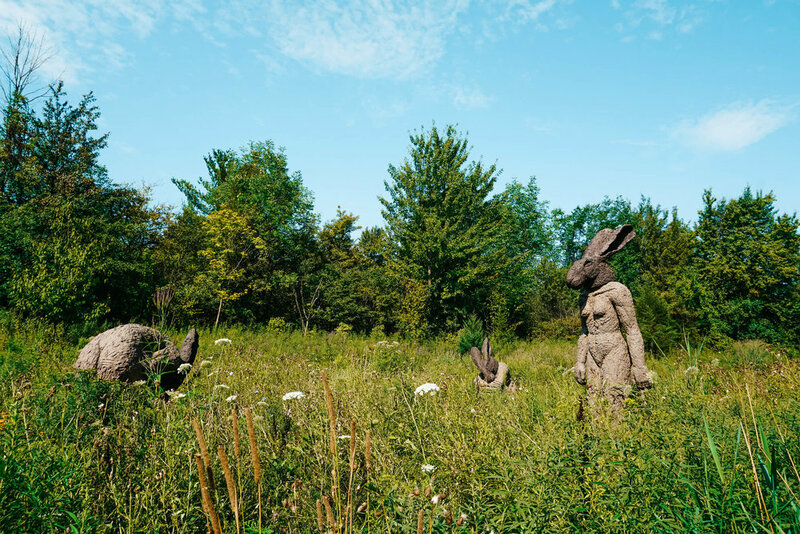 One work in particular was of half rabbit-half human sculptures in an overgrown meadow. It screamed “The Hills Have Eyes” to me (even though I’ve only ever seen the movie trailer), or an episode of Black Mirror. Have you ever seen a scary sculpture or painting before? Here were some of my other favorite works. I particularly love the pieces that exhibit intricate detail or harsh grandeur surrounded by delicate elements of nature. Lately I’ve bee in love with reds, coppers, and rustic tones against green landscapes so it is no surprise why some of these are my favorites. Looping back around toward and beyond the Japanese garden, we retreated to the Shade Garden for relief from the sun. Don’t be like Alex. He’s notorious for forgetting his sunscreen, even if it is placed in his hands. The Shade Garden was just what we needed to provide the necessary relief from the park’s open air layout. The shade garden led us to a farm garden, with a barn and mini hops vineyard! There was also a small house where we could use the toilets if necessary. 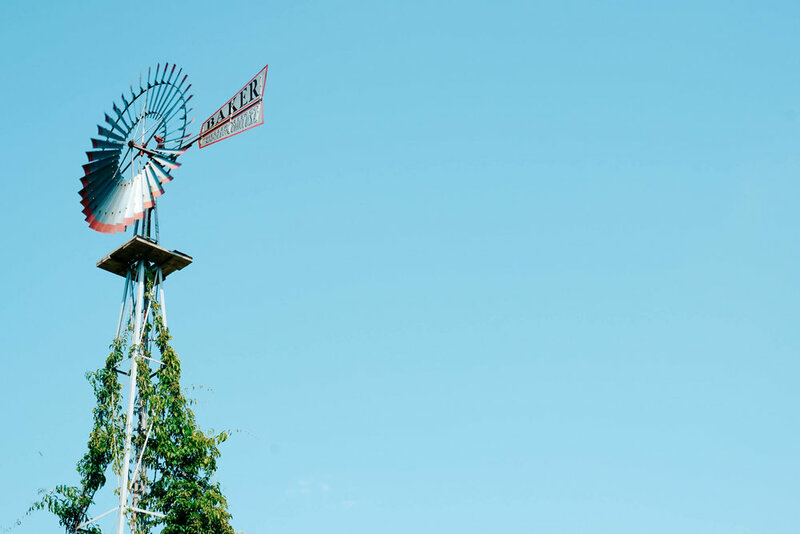 Our time was running out so we didn’t spend a significant amount of time at the farm, though I think it is well suited for kids visiting the gardens and park. From here we took the boardwalk through wetlands to loop back to the beginning of the park, near the visitor center. The boardwalk is a little uneven and I definitely tripped a couple times, but I think it is still fairly accessible if you are careful. From the boardwalk we spotted a family (or friends) of turtles! 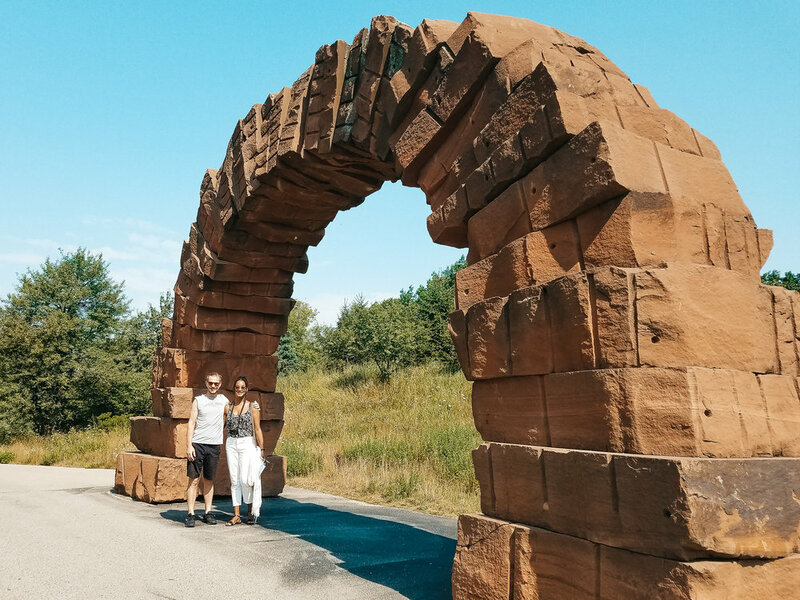 We had a great time at the Frederik Meijer Gardens & Sculpture Park in Grand Rapids, and I’d consider it two-hours well spent! I would definitely return, because I had to hurry through a few exhibits last time, but I’d recommend allotting 3-4 hours there as a minimum. Would you visit these gardens & sculpture park? Let me know in the comments below if you are a fan of sculpture parks or gardens. Don’t forget to share this photo story if you enjoyed it!